The game’s credits list Michiya Hirasawa (founder of MINT), Tsukushi Sasaki and Akihiko Mori for “Music & Sound Effects”. Looking at Michiya Hirasawa’s resume, it’s obvious that his area of expertise was sound programming rather than music composition. Tsukushi Sasaki’s portfolio is rather slim and again includes more work on sound programming than on music. 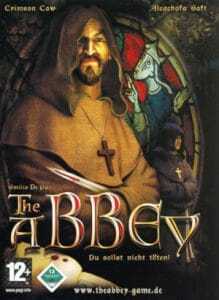 That – and the musical style of Shien’s Revenge soundtrack – suggests that this score was actually written by Akihiko Mori. Mori had delivered his breakthrough work with Lock On the year before and it might have well been on the strength of this soundtrack that he joined MINT. After several years of relatively infrequent output, this move to MINT heralded the beginning of an immensely productive period for Mori. His enthusiasm about this change of circumstances – joining MINT likely meant more steady work – is audible throughout the entire Shien’s Revenge soundtrack. On Lock On, Mori had displayed his penchant for dense, elaborate instrumentations, applied to a jazz/rock/orchestra genre mix. On most of Shien’s Revenge, Mori applies the same talent to orchestral action music, with thrilling results. 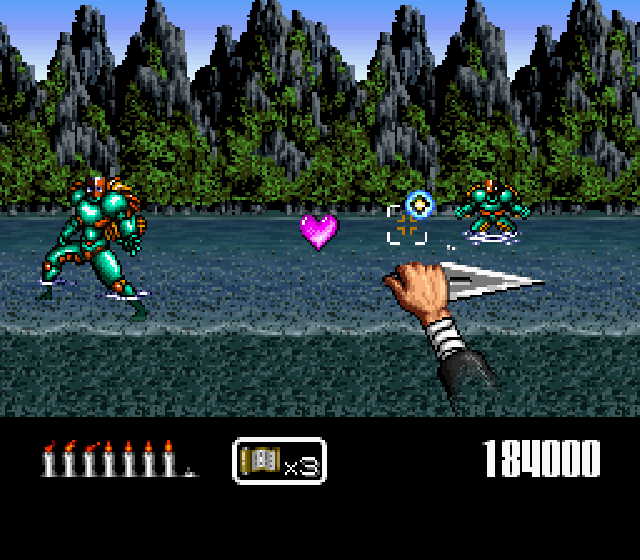 Very few SNES composers match Mori’s talent to write astoundingly rich orchestral music, hyper-charged here through the game’s frantically-paced gameplay. Listening to many of Mori’s compositions, it’s remarkable just how many ideas he crams into a single piece, even if it’s shorter than one minute (unlooped). New melodies, rhythms and instrumental colours whizz by at breakneck speed, and yet Mori is able to control his cues’ consistency and flow. This is a composer who doesn’t just write orchestrally-styled SNES music, but knows how to handle the (synth) ensemble at hand like an actual orchestra. Try out “Burning Fortress”, an orchestral powerhouse that changes its lead instrument every few seconds, but maintains constant forward propulsion. Never sticking with one melody or rhythm for very long, “Burning Fortress” is game music that’s closer to film soundtracks or classical music than the vast majority of SNES orchestral scores. “With Cap and Baton” is equally possessed of indomitable energy, but also maintains nervous tension through its jittery rhythms and several stops and starts. The most breathless example of Mori’s anything-and-the-kitchen-sink approach is “Military Castle”, which perfectly balances repetition (heavy rhythms and hammering piano chords) with an immensely varied structure. The sheer amount of orchestral busyness and details doesn’t mean that Mori entirely foregoes slower material and mood-building exercises. “Misty Landside Street” remains within the soundtrack’s action-packed template, but its fluttering woodwind calls, quivering strings and sustained, cleverly implemented background chords paint a potent image of the cue’s hazy location. Other breathers arrive in the shape of “Fear Factory” and “Hallucination”. It’s particularly on the game’s excursions into future time zones that Mori drops the frenzy of his other pieces, but still maintains the soundtrack’s intensity. “Fear Factory”’s fairly static material is still captivating, thanks to how unpredictably its elements – a 4/4 bass pulse, uneasy flute and brass chords – interact with each other. “Hallucination” almost ventures into horror score territory, when an oppressive string melody and harp arpeggios are followed by nothing but dissonant, creepily echoing piano chords. Indeed, while Mori’s handling of traditional orchestral forces is nearly perfect on the Shien’s Revenge soundtrack, he is absolutely capable of infusing his palette with less classical elements. Not that Shien’s Revenge is as much of a genre mix as Lock On, but the game’s time-travelling element gives Mori a welcome excuse to add yet more colours to his music. The game’s Japan levels receive the expected pentatonic string progressions and local woodwind colours, integrated seamlessly into the turbulent orchestrations. The difference between these tracks and those set in Manchuria and Mongolia is subtle, but very much present, as Mori manages to give each location its own signature sound. 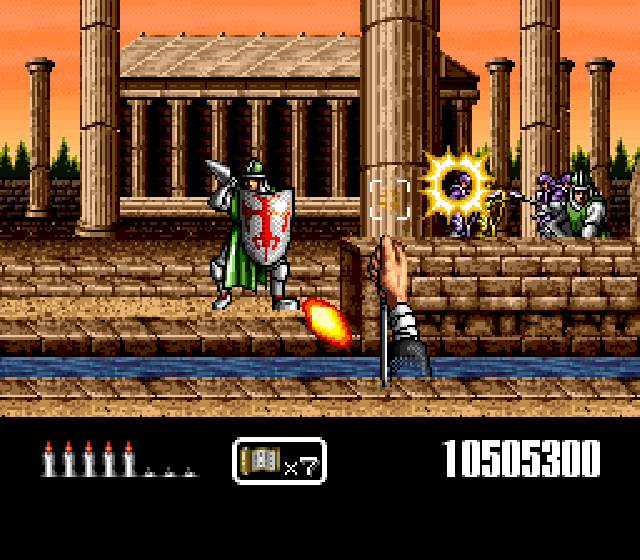 No doubt the biggest challenge would have been to find the right sound for the game’s ancient Greece stages. Mori’s solution – monolithic rhythms, declamatory ostinati and crashing melodies – isn’t entirely surprising, but once more integrated perfectly. And the focus on wooden xylophones on “Zombie Taurus” is an inspired and effective choice. 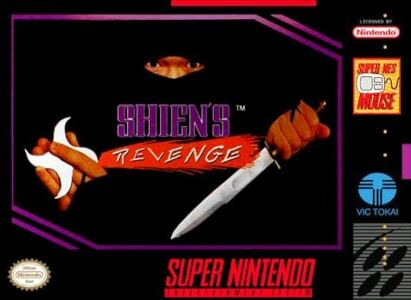 Towards the end of the Shien’s Revenge soundtrack, once the game’s sci-fi trappings come through more clearly, electronic elements make their presence felt more strongly – but so do rock guitars and drums. “Masked Ninja Robot” is an intriguing change of style after the orchestral rush that preceded it – a mid-tempo rock track with electronic backing that is both terse and melodic through its unpredictable guitar soli. Final boss track “Bad Dream” picks up the same rock/electro/orchestra combination and turns it into something more conventionally powerful and spectacular. Its heroic trumpet lead spearheads a composition whose hard rock sounds only make the music denser and more dramatic still. No wonder than that “Ending” closes with enthusiastic, impressive dual guitar heroics that close the Shien’s Revenge soundtrack on the most exuberant note – the perfect summation of this joyfully bustling score.